You can see an official big map of it here or you can look at a google map we created. The district was renamed Halifax South Downtown in 2013. 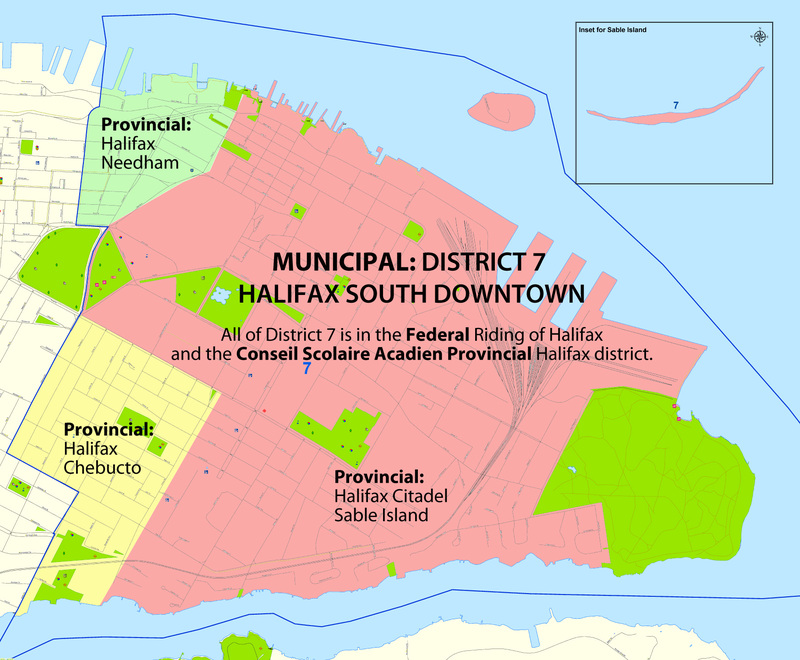 The district is south of a boundary that runs from the Northwest Arm along Jubilee to Oxford, then north up Oxford to Quinpool, then east along Quinpool and Cogswell to North Park, north up North Park to Cornwallis, then is south of Cornwallis to the harbour. It also includes Sable Island. The district now includes all four peninsula Business Improvement Districts, both hospital sites, St Mary’s and Dalhousie universities, King’s, NSCAD and the Atlantic School of Theology, and 22,000 residents. The district is the economic heart of the city, hosting almost half of the office jobs in the municipality, and generating almost 20% of commercial and residential property taxes paid in all of HRM. There is a municipal service office located in Scotia Square, inside the Duke Street entrance. Halifax Regional Police provide coverage through the Central Division & Community Response Officers. Halifax Regional Fire and Emergency provide primary response from Station 2, University and Robie Street, which is the oldest operating fire station in Canada. The Halifax Central Library opened in 2014. The district is home to three regional parks – Grand Parade, the Common, and Point Pleasant Park. There are fourteen area parks, ranging in size from a couple of hundred square feet to a couple dozen acres. Three recreation centres serve our district, Centennial Pool, Citadel Rec and St Mary’s Boat Club. In those spaces are the skating Oval, a free pool, a skate park, tennis courts, sports fields, playgrounds and much more. For HRM contact information visit this page. OnMarch 31, 2018 the provincial government dissolved elected boards for the non-CSAP schools, directing that education be administered by an appointed provincial council. No contact info has been provided yet.